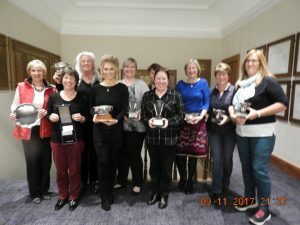 The AGM and Prize Giving took place last night at Gullane GC. In addition to the usual AGM business the updating of the Association Rules was also approved unanimously. The cancellation of the Scottish Golf SGM meant that the intended discussion on how the County should exercise its votes was not necessary. Elaine made a few general comments on what had been happening and what we might need to be aware of for the future. She also indicated that as and when we had a clearer idea of what Scottish Golf was going to put forward at the AGM in the spring an email would be sent out seeking views or more likely a meeting would be convened to discuss the proposals. 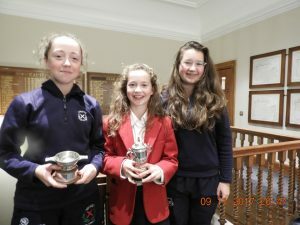 in a change to the usual order the Junior Prize Giving followed the Junior Report with Grace Crawford and Emma Chapman again winning the Junior Scratch and Handicap trophies with Kate Crawford runner up this year in the Handicap. Former Junior Joanne Free is now enjoying her first year at college in Minnesota and Elaine read out an email from Joanne telling us about her routine and experiences in her her first semester. She is clearly enjoying college and a return to competitive golf despite the long days. Having tracked down a store that sells PG Tips all she needs now is to find some custard creams or chocolate bourbons to make her the “happiest person in the world”. The main prize giving followed the meeting and the trophy winners gathered for the usual group photo.